A cactus-inspired twist on fuel cell technology co-developed by the CSIRO can improve their efficiency by a factor of four. A twist on fuel cell technology that mimics the skin of a cactus plant could be a game-changer for the electric vehicle industry, according to the CSIRO. The technology – co-developed by scientists at CSIRO and Korea’s Hanyang University – is a new type of water repellent membrane that can improve the efficiency of fuel cells by a factor of four. According to CSIRO researcher and co-author Dr Aaron Thornton, the skin works in a similar way to a cactus plant, which thrives by retaining water in harsh, dry environments. “Fuel cells, like the ones used in electric vehicles, generate energy by mixing together simple gases, like hydrogen and oxygen,” Dr Thornton said in a paper published in the Nature journal. “However, in order to maintain performance, proton exchange membrane fuel cells – or PEMFCs – need to stay constantly hydrated. “At the moment this is achieved by placing the cells alongside a radiator, water reservoir and a humidifier. According to CSIRO researcher and co-author Cara Doherty, the team’s new cactus-inspired solution offers an alternative. “A cactus plant has tiny cracks, called stomatal pores, which open at night when it is cool and humid, and close during the day when the conditions are hot and arid,” Dr Doherty said. “This membrane works in a similar way. Water is generated by an electrochemical reaction, which is then regulated through nano-cracks within the skin. “The cracks widen when exposed to humidifying conditions, and close up when it is drier. “This means that fuel cells can remain hydrated without the need for bulky external humidifier equipment. Professor Young Moo Lee from Hanyang University, who led the research, said the development could have major implications for a number of industries, including electric vehicles. “At the moment, one of the main barriers to the uptake of fuel cell electric vehicles is water management and heat management in fuel cell systems,” Professor Lee said. “This research addresses this hurdle, bringing us a step closer to fuel cell electric vehicles being more widely available. If the fuel cell could be made 4-fold more efficient, then it must have been worse than 25% efficient. I had not realised they were that bad. Even an internal combustion engine is a bit better than that. Thanks for the reminder of that article. If a standard fuel cell is already 50% efficient considering just the fuel cell, not electrolysis or the EV running on the fuel cell, then it can’t get four-fold more efficient, as suggested above. They are talking dry&hot conditions there – i.e. getting the performance of the FC in dry&hot conditions as good as in cold&wet conditions. And increasing the efficiency of the FC 4 fold in hot&dry conditions? Right.. and what about the efficiency in cold&wet conditions where they already peaked at their “optimum” – which is being used to compare it to a BEV and it still loses out by a factor of 3? 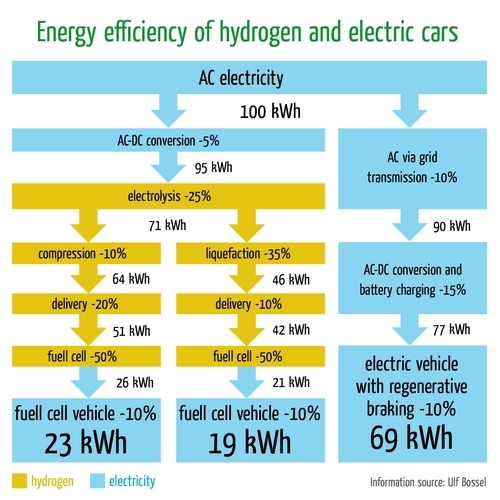 The above graph gives the overall picture where the end delivered power of each is compared so improving the fuel cell will give a better picture, however the compression, transportation and the conversion are all against the hydrogen cycle. Undoubtedly more work will improve each area. Unless you have a local use for the heat, compressing gas will unavoidably lose a certain amount of energy, even if your compressor has perfect lubrication and a 100% efficient motor. The article talks about efficiency gains in dry&hot conditions (which is nice and dandy and all, as they were EVEN WORSE there) but they don’t talk about the ability to push the efficiency of the FC beyond what is up there in that graph. The numbers in that graph are more or less the physical/technical limits of the technology under optimum conditions – it’s not getting better than that. No technology, no physics will be able to go beyond that – only fairy-dust and hocuspocus will do. IMHO – FCEVs are done with. They won’t come out of the closet any further. All what you did see so far is what can be done and will be. BEVs already is the dominant form and going head on with ICEV in the mean time. Honda finally does get it it seems with their PR about using the FCEV platform for hybrid/battery vehicles in the future and Toyota will get it as well.. just give them 12 months – they’re stubborn, not dumb.. When was the last time you did hear anything re hydrogen from BMW or Mercedes? I can not remember MB or BMW on the subject only Toyota, not that i am particularly interested in the hydrogen cycle 10 to 12 years ago it was mooted as the savior of the motor vehicle. Even then the making, storage, transport and safe use in a vehicle looked like large obstacles. I can not see it improving now in any marked way. With incremental improvement in battery technology both in energy density and cost as well as changeability it would appear that EV’s will be to the fore from now on as you point out.